Companies, unions, and politicians on both sides of the aisle seek to repeal the coming excise tax on high-cost health plans. 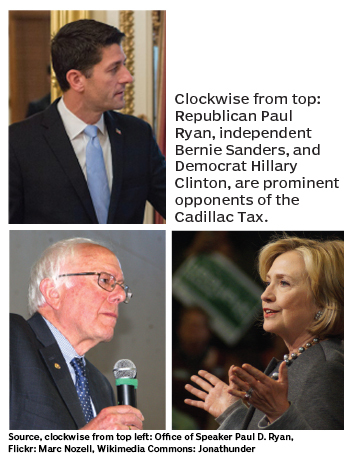 For all their differences, Hillary Clinton, Paul Ryan, and Bernie Sanders agree on one thing: the “Cadillac tax” should be scrapped. Scheduled to be implemented in 2018, the 40% excise tax on high-cost health-benefit plans (hence the nickname) has been controversial from the beginning. Both the U.S. Chamber of Commerce and the AFL-CIO opposed creation of the tax, a provision of the 2010 Affordable Care Act, along with scores of politicians on both sides of the aisle. This year, Republicans and Democrats on Capitol Hill have launched several bills to repeal the excise tax. One, sponsored by Sens. Dean Heller (R–Nev.) and Martin Heinrich (D–N.M. 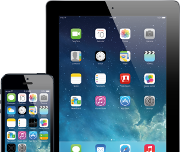 ), was introduced on September 17 as a companion to a House bill unveiled in April by Democrat Joe Courtney of Connecticut. Another Senate repeal effort was launched on September 24 by Democrat Sherrod Brown of Ohio and Sanders, a Vermont independent, while a bill in the House was filed in February by Frank Guinta (R–N.H.). The legislative efforts are a nod to intense corporate pressure to repeal or at least modify the excise tax, which assesses a 40% levy on any health plan whose combined employer and employee contributions exceed threshold amounts. For 2018, those thresholds are $10,200 for self-only coverage and $27,500 for families, although they can be adjusted based on various factors. 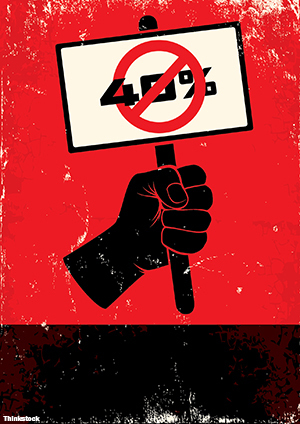 A broad-based lobbying coalition opposed to the tax, called Alliance to Fight the 40, was launched in July. Members include the American Benefits Council (an advocacy group with more than 400 employer members), individual companies, insurers, and benefits consulting firms, among others. The National Business Group on Health, which represents the views of its 425 employer members on national health policy issues, also opposes the tax. Based on internal estimates and analysis, the NBGH expects that 48% of its employer members will have at least one health plan triggering the tax in 2018 if they do not make any changes to the plan. 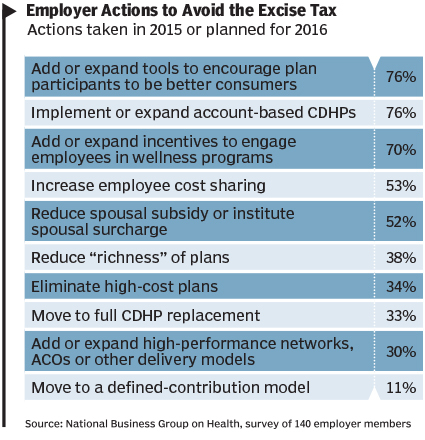 Of health plans in which the most employees at a company are enrolled, only 28% would run afoul of the tax in 2018 without any changes, but that number rises to 51% by 2020, according to the NBGH. In fact, by the mid-2020s, virtually all employer health plans will be over the cost limit, according to various analyses. Why? Because after 2018, annual increases in the thresholds will be indexed to the Consumer Price Index rather than to medical-cost inflation, which has been significantly outpacing the CPI for many years and presumably will continue doing so. That’s why companies’ efforts to avoid the tax may, at some point, prove fruitless. In an NBGH survey of 140 employer members, most respondents said they could delay the tax through plan changes by only two or three years. • To lower health care spending. “Many employers are making significant changes to their health care plans as a result [of the impending tax], which means that [it] is working at least in part as Congress intended,” the AHPI report said. • To generate federal revenue to help pay for Medicaid expansion and for tax subsidies for lower-income people to buy insurance through the public health insurance exchanges. Projections call for $87 billion in new tax revenue over the first 10 years the tax is in effect. Making those changes will help achieve the second goal of lowering health care spending, but likely at a cost to employees. To avoid incurring the tax, companies may have to reduce or end practices such as contributing to employees’ flexible spending accounts, health reimbursement arrangements, and health savings accounts, which are collectively referred to as consumer-driven health plans (CDHPs). 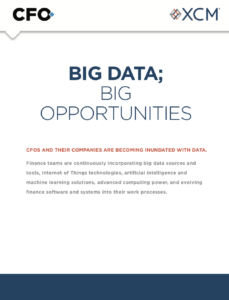 In fact, since amounts that employees contribute to such accounts also count toward the calculation of total plan costs, some employers may modify or even eliminate these programs, according to Kra. The use of on-site clinics and employee assistance programs that provide some type of medical care may also be cut back, and medical-provider networks may be narrowed. At the same time, employers are likely to make greater use of high-deductible health plans (HDHPs), shifting more of the cost burden to employees, whose out-of-pocket expenses will not count toward the calculation of plan costs unless they are contributed to CDHPs. “You could see a ratcheting back of many things that keep employees engaged, productive, and healthy,” says Jody Dietel, chief compliance officer for WageWorks, an American Benefits Council member organization and a third-party administrator of CDHP accounts for some 45,000 employers. The prospect of attaining the third goal, generating revenue to pay for some ACA provisions, may be even more dubious. The Congressional Budget Office anticipated that a large majority of the anticipated $87 billion in revenue would come in the form of increased individual income taxes, after employers raised wages to compensate for employees’ watered-down benefits. There are also fairness issues associated with the Cadillac Tax; two stand out. One is the ACA’s lack of recognition that health care costs are heavily influenced by where they’re incurred. A company in Iowa with its workforce solely in Iowa, a low-health-cost state, probably could have a zero-deductible plan and not hit the Cadillac tax, says Dietel. The other big fairness issue involves the inclusion of funds that employees direct into CDHPs in the calculation of plan costs. 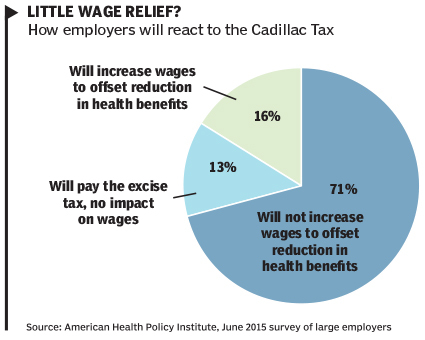 Despite the legislative efforts to repeal the Cadillac tax, many observers expect that relief will come in the form of modifications to it — because, they say, legislators will see that the tax will affect many more employers than originally intended. Indeed, at a conference in April, Gruber spoke candidly about his antipathy for tax-free health benefits. “Look at how we got here,” he said. “After World War II the government imposed wage controls, so employers got around that by offering health benefits, and the IRS ruled that the insurance would not be taxed like wages. But no economist would have ever supported that decision. It’s compensation. Another way the excise tax provision was structured to avoid political land mines, according to Wojcik, was to have the tax paid by insurers, in the case of insured plans, and plan administrators in the case of self-funded plans. Never mind that insurers and administrators surely will recoup those costs from their clients, one way or another. Increased use of HDHPs is expected to be a fundamental strategy, notes Kra. Some companies also may offer an HDHP but not set up health spending accounts or provide employees with any functionality to do so. Employees would be free to set up their own accounts through bankers or brokers; contributions to those accounts would not count toward total plan costs for purposes of calculating the excise tax.